This morning we awoke to a thick blanket of snow and raucous bird chatter outside. 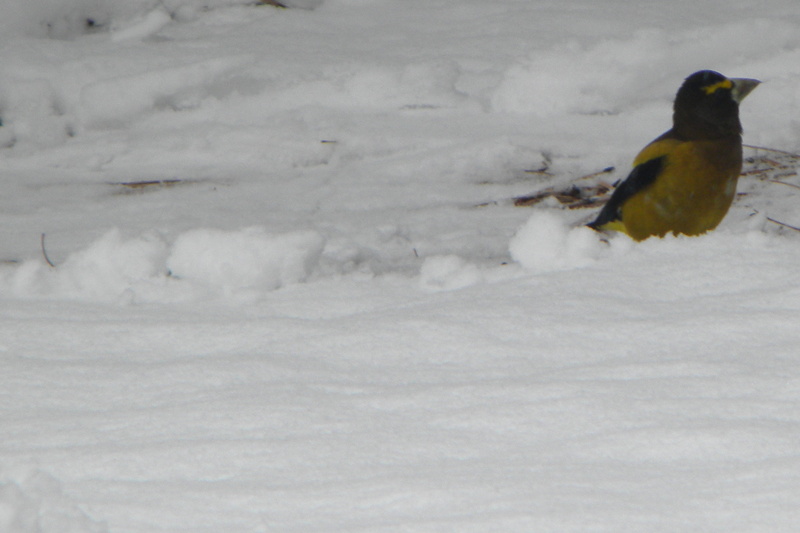 The evening grosbeaks are back. I saw this species for the first time almost exactly two years ago to the day, a timeline I remember well because little A. had just been born and I spent many hours those first precious weeks at the sunroom bench, nursing and holding and watching spring come to life outside the window. This was a bird I had never noticed prior to that because, perhaps, I had rarely paused long enough to consider them. But newborns do have a way of slowing life down in the best possible way, and forcing someone like me to adapt to a slower, more humane pace. 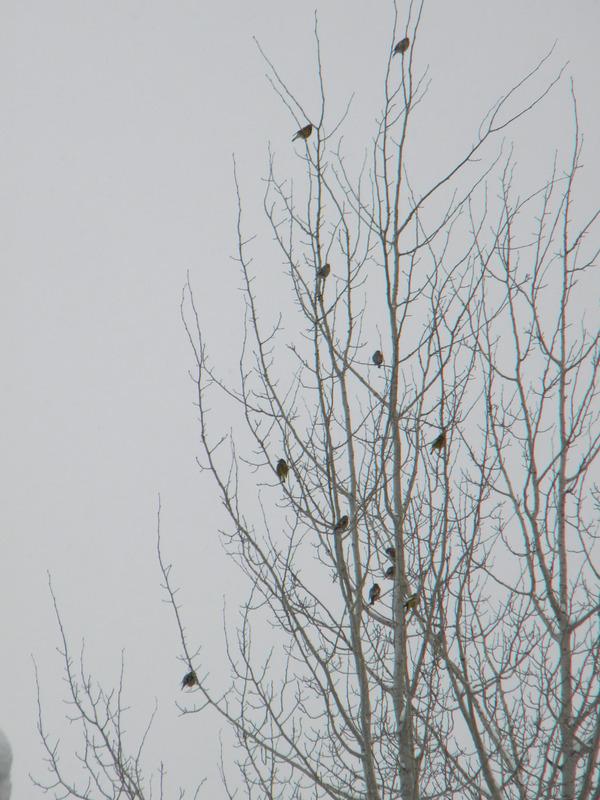 And notice grosbeaks. The grosbeaks were just outside our door, which was enough motivation for the girls to get bundled up and trundle outside. A. lasted only a few minutes (after declaring her hand-knit woolen mittens “nasty” and refusing to wear them, her fingers soon became cold). But M. bird-watched for quite awhile, trying to master the art of binoculars. We watched the grosbeaks flock into a giant white fir tree a few hundred feet away, then into the skeleton of an aspen across the street. When M. tired of this, she became the bird, building a nest in the snow, sitting on snowball eggs until they hatched, and then seeking out ‘insects’ (pine needles) for her babies. 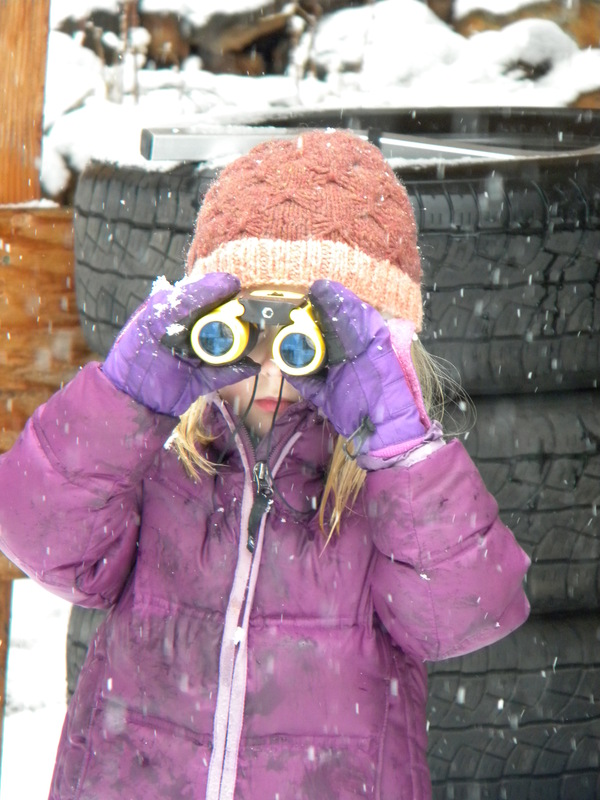 She had me play birdwatcher through this entire charade, sighting her in the binoculars as she flew around the yard.